[L?] XXXVI 1- Fare from Charles City (and return)--error over C. M. & St. P. R. R., Iowa Central & Diagonal $5.44 2. For hack fare to hotel $0.50 3. For bed and breakfast at "Kirkwood" $1.50 4. 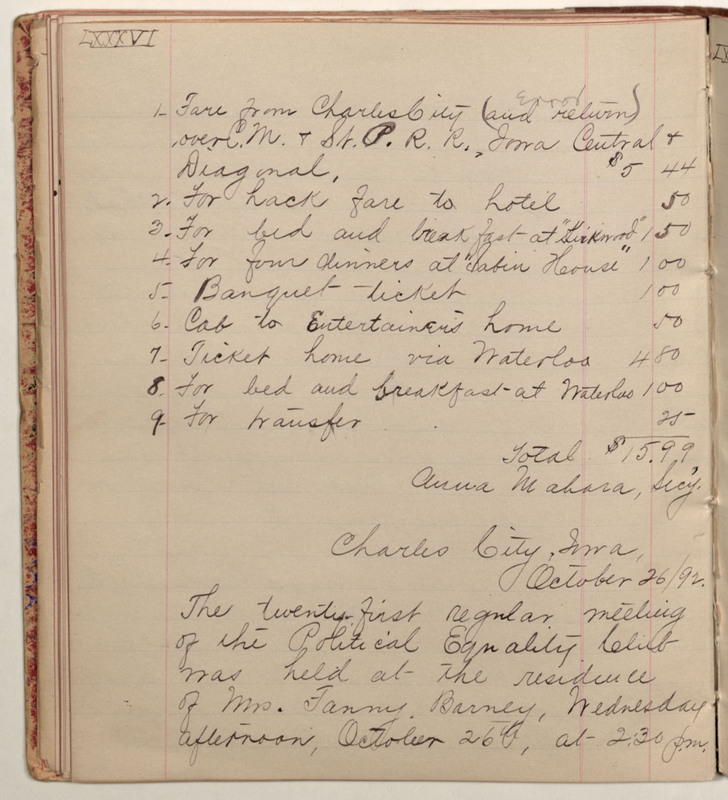 For four dinners at "Sabin House" $1.00 5. Banquet ticket $1.00 6. Cab to Entertainer's home $0.50 7. Ticket home via Waterloo $4.80 8. For bed and breakfast at Waterloo $1.00 9. For transfer $0.25 Total $15.99 Anna Mahara, Sec'y Charles City, Iowa October 26/92. The twenty-first regular meeting of the Political Equality Club was held at the residence of Mrs. Fanny Barney, Wednesday afternoon, October 26th, at 2:30 p.m.